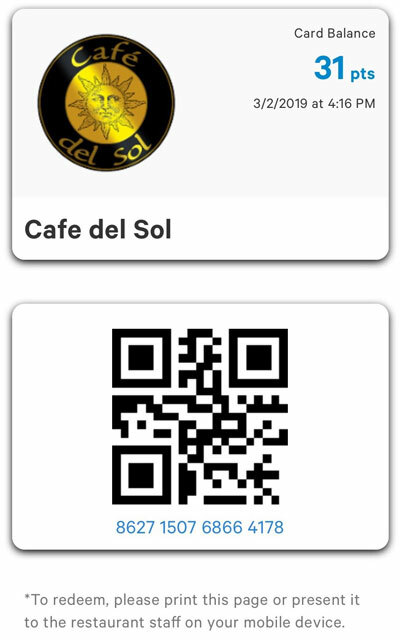 We love our loyal guests so we’ve created the Café Del Sol Rewards program so you can start earning points on every purchase and automatically receive rewards. For every dollar spent a point is earned. For every 100 points a $10 reward will be added to your account. Receive 20 bonus points for signing up. To sign up, visit any Café Del Sol location and place an order. At the time of payment you’ll have the opportunity to join the program by providing an email address. A signup email will be sent issuing a digital rewards card and account login info. Save the image of your digital card in your mobile device and it will even allow you to link the credit card used for instant recognition on future purchases. You’ll earn a point for every dollar spent, as well as receive 20 signup bonus points.